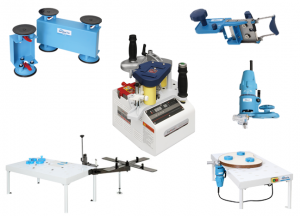 The Co-Matic Portable Edgebander is the result of over 10 years of manufacturing and refining by Co-Matic Machinery. Woodworkers from one-man shops to large production shops are now edgebanding radius and/or straight parts with this hot melt edgebander which they previously had to edgeband manually with contact cement, pre-glued tape, or outsource. 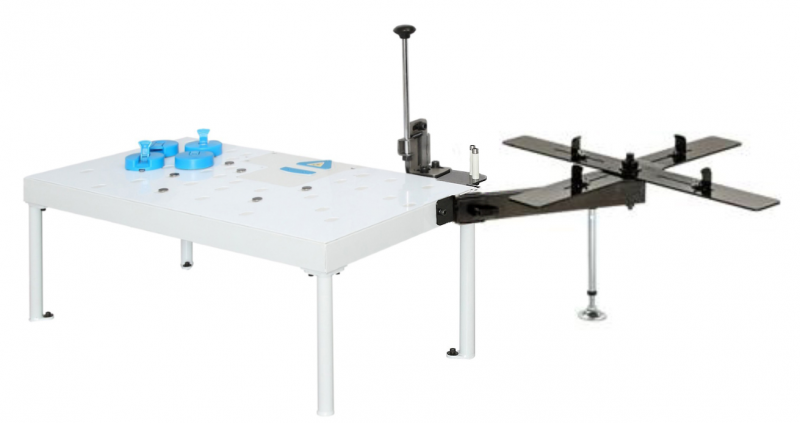 The Co-Matic Portable Edgebander can be used as a hand-held edgebander or table-top edgebander when mounted into the compatible ST95B Table System. Most edgebanders only allow for edgebanding straight edges with thin tape. Our system provides you with the flexibility to quickly edgeband (0.4mm to 3mm thick) nearly any shape and size of work-piece. 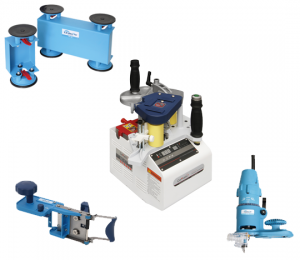 Contact us with any questions you may have or to see if the Co-Matic Portable Edgebander is ideal for your application. Backed by many woodworking shops (both large and small) throughout North America, feel free to contact us for references. Price Match: Our prices are hard to beat and our service and customer support are unmatched. You can have peace of mind knowing that you are getting the best pricing and customer support available. Although rare, if you find an equivalent or similar product to ours with better pricing, let us know and we will beat it. They (Co-Matic Portable Edgebander) are simple to use (after a little practice) and will actually do 3mm just as well as our Brandt contour bander......... For a one man shop I think this thing could serve all his banding needs." "I have had this edgebander for about 18 months now and it has been one of my best purchases. It works great for all types of edgebanding from .5 mm to 3 mm. I have also used it to put laminate on edges of countertops and back splashes. It has saved me a lot of time because it is quick and easy to make adjustments to fit the projects needs. I would highly recommend this product." "The edgebander is working great. We were using the 0.5 mm flat edge tape and it has a much better finish as compared to other machines I tried. Your customer service has been excellent. I couldn't ask for any better." "I gave the edgebander a test run right when I got it and it works really great. It is just as easy to use as I would have expected in the videos." "We used to do the curved edges by hand and it took a long time. This little edgebander has made this process a whole lot quicker." "Well built and consistent glue line. Manual adjustments are very helpful. 65mm thickness and bevel edge capability is a plus. 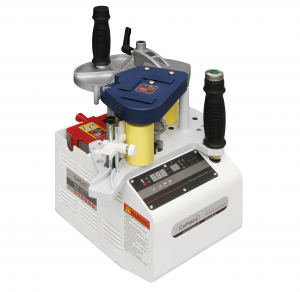 Multiple speed operation is helpful for many different applications." "Just started using the BR 500 for putting 3mm PVC on 1-1/8" thick counter tops with 3" radius corners. It works great with flexible PVC, not as well with standard PVC. We've also successfully applied 2mm and .020 PVC on a tighter radius. This should save us a considerable amount of time compared to gluing by hand." "I build frameless cabinets and desks for mostly industrial use. This tool cut my banding Time way down. It’s a learning curve but when you get used to it this bander works great. I’ve used it on .04 to 1/8” thick banding and have no problems other then you need to adjust the temperature. We had to go down to 275 Farenheit for the thinner banding so it wouldn't melt. I have all Festool tools in my shop and this is the only time I went off the brand. I love all of them but they are overpriced. That’s why I tried something different and this tool works just as good and it hooks up to my Festool vacuums the same. The instructions this came with are not the best, but overall I love it for its size and versatility." "We needed a contour bander for the occasional curved edge. We couldn't justify buying a large unit for the few times that we need to do this type of work. This unit fits the bill perfectly for us. So far, so good." "We were in a rush to get the portable edgebander set and Kyle really went out of his way to get everything to us in a very speedy manner. Edgebander works perfect and Kyle is such a pleasure to work with!"